Lewis Hamilton put smiles on the British crowd at Silverstone as the World Champion secured pole position for the race. Sebastian Vettel and Kimi Raikkonen though made sure it won't be a walk in the park for the Brit tomorrow. Just ahead of the start of qualifying, Toro Rosso engineers were still very busy with the car of Pierre Gasly. On the other side of the garage, the team didn't bother anymore, as Hartley was not to take part in qualifying due to the damage incurred by his crassh in FP3. Still, despite the feverish works, Gasly was the first man out on track. After track action began to increase, Lance Stroll made an early end to it as he ended up in the gravel trap. He reported to have "suddenly lost the rear". He was surprised enough to be unable to correct it, and get stuck into the gravel. What followed was a bunch cars eager to get a laptime in, resulting in quite a bit of traffic early after the green flag. Leclerc was out first, but Raikkonen rapidly passed him. Along with both Mercedes, he's the only man who used the medium tyres. The top three teams rapidly settled into the top 6, leaving the track to the others to decide which three drivers would drop out ahead of Q2. Vandoorne eventually failed to make the cut, along with Sirotkin. The Russian had an eventful session and crashed off at Stowe halfway into the session, but still managed to make his way back to the pits to continue his running. The surprise elimination was perhaps Carlos Sainz, though he complained of traffic with Magnussen. In Q2, Raikkonen and both Mercedes switched to soft tyres. The approximate 1s gap between the two tyres was perhaps a bit too much for qualifying. Vettel initially went fastest with a new track record, but after an aborted flying lap, Hamilton improved on that to go fastest by a tenth. Once again the top 6 were quickly thereabouts, with Hulkenberg, Perez, Alonso, Gasly and Ericsson dropping out of Q2. This meant that Leclerc once again made it into Q3, confirming his stunning form and the progress Sauber is making. This Q3 thus ended up to be the first of the season not featuring a Renault works car. The final shootout turned out to be a close fight for pole, with Hamilton pushed to his limits as Vettel improved on his initial marker by just 0.060s. Raikkonen slotted into third, ahead of Bottas and both Red Bulls. Ricciardo ended up 6th, more than 1.2s off the pace due to being unable to use DRS. 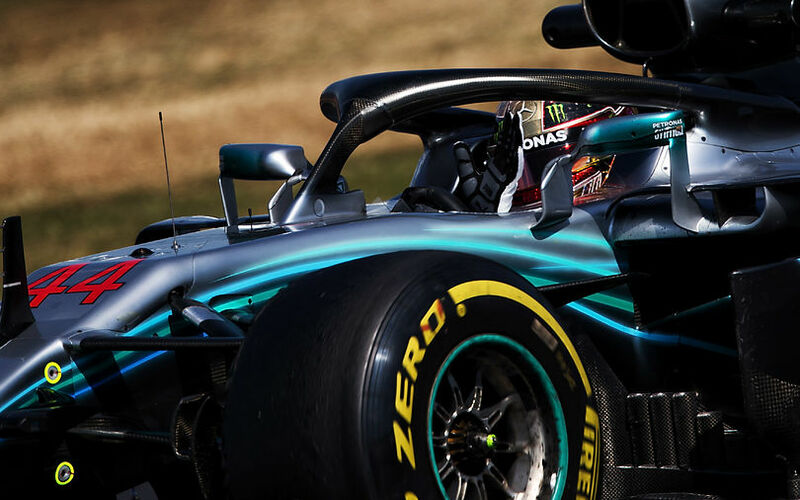 On the second runs, Hamilton made up for his mistake in his first run and went fastest, securing his 50th pole for Mercedes and his 6th at Silverstone. The Englishman has certainly set the scene to secure his 5th consecutive win at Silverstone. Kimi Raikkonen improved to third, but he was still disappointed, saying "that's how it goes" after failing to get the second sector perfectly right.